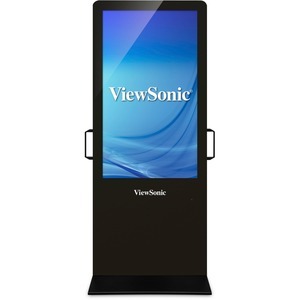 The ViewSonic EP5012-L is a 50" all-in-one free-standing digital ePoster kiosk with a sleek, slim design. It delivers high-impact messaging in a number of venues including shopping malls, retail stores, office complexes and school buildings. Great for grabbing attention in busy, high-traffic areas, the EP5012-L comes with a scratch-proof tempered glass faceplate for added durability. Featuring Full HD 1080p resolution, 176°/176° wide-angle viewing, 450-nit brightness, 5,000:1 contrast ratio, and dual 6W stereo speakers, the EP5012-L delivers customized multimedia messaging with vivid clarity. Photo and video files can be played back using the integrated media player and 8GB of internal memory, or directly from a USB hard drive. The bundled ePoster Manager Express Plus software make it easy to load and schedule customized multimedia content. Flexible HDMI, D-sub, USB (x2), and LAN connectivity also allow for additional content loading options from a PC or networkable media player. The EP5012-L also features an Embedded media player platform, enabling the implementation of customized messaging applications. Simple auto on/off scheduling via an on-screen display, as well as a security lock design, making this a reliable, and easy-to-maintain digital signage solution. ViewSonic's EP5012-TL all-in-one free-standing ePoster featuring a sleek, slim premium design delivers dynamic, eye-catching messaging in high-traffic areas. Besides the attractive design, the EPT5012-TL is also durable, utilizing a tempered glass faceplate that offers scratch-proof protection to keep your ePoster looking new year after year. The EP5012-L utilizes an energy-saving LED backlight that consumes 35% less power than conventional CCFL backlight displays. This provides for a lower overall cost of ownership, along with a higher ROI, making this display a great long-term investment.